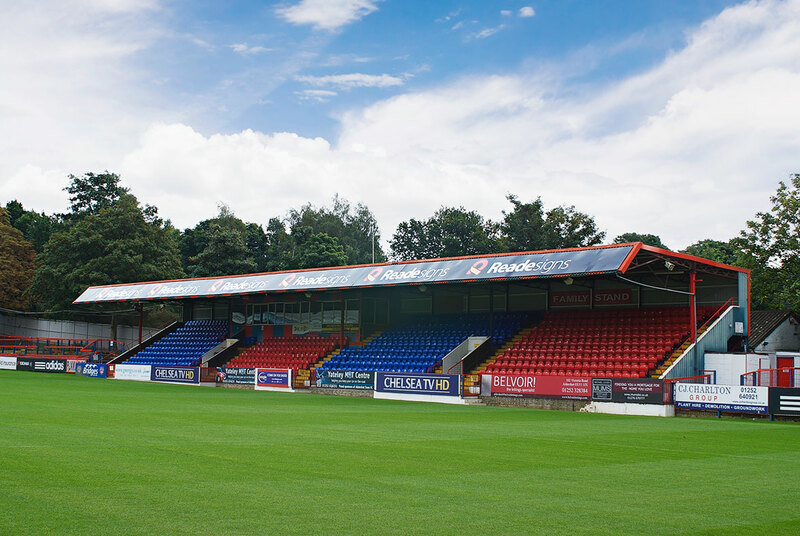 Reade Signs have been busy upgrading the sponsorship signage throughout Aldershot Town Football Club’s EBB Stadium ready for the first game of the season. As sponsors of the South Stand, it was a perfect opportunity for Reade to proudly present its rebrand with signage across the length of the stand, and support other sponsors including Eagle Radio, Wellesley Grainger, Muller Milk, Gnergy Ltd, Hi Speed, Knights Foundation, R-Collard and ELM Group. This included a complete rebrand of the Patrons Lounge incorporating branded wallpaper and stunning acrylic signage, bold pitch boards, stand signs and banners. Now the new football season is in full swing spectators and players alike can enjoy the game surrounded by fresh, clear and excellent signage provided by Reade Signs.